House at 1421 Harvard St.
Harris County administrative offices are located at 201 Caroline Street, Houston, TX 77002; phone: 713-755-6411. Photo: Lumber, oil, and ranching tycoon James Marion West (1871-1941) and his wife, Jessie Dudley (1871-1953), hired eminent Houston architect Joseph Finger to design this 17,000-square foot house as headquarters for their 30,000-acre ranch. 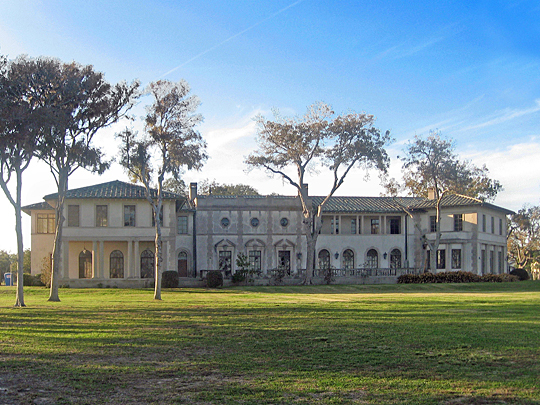 Built in 1929-30, it is an excellent example of the Italian Renaissance revival style. It features exceptional ironwork by Berger & Son, classical pediments and arched windows. Listed on the National Register of Historic Places in 1994. Photographed by username:I_am_jim, 2012 (own work) [CC-BY-3.0 (http://creativecommons.org/licenses/by/3.0)], via Wikimedia Commons, accessed October, 2012. The county was founded in 1836 under the name Harrisburg County. The name was changed to Harris County in 1838. When created the county encompassed the territory of the old municipality of Harrisburg plus Galveston Island. The county is named from John Richardson Harris [1790-1829], an early settler and founder of the town of Harrisburg. Harris was born in Cayuga, New York.